2016 Subaru BRZ sports coupe sales are going down every month and it’s badly in need of an overhaul and STI should be allowed to do it. 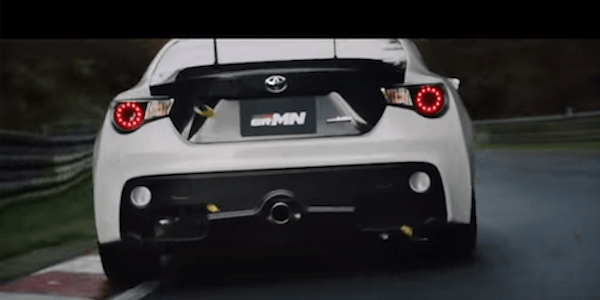 Toyota has done it with the GT86 Limited Edition GRMN tuned by Toyota’s Gazoo Racing and Subaru needs their motorsport division to do the same thing with the BRZ. Masahiko Kageyama Racing driver for Toyota’s Gazoo Racing takes the GT86 for a fast lap around the Nurburgring and shows what the Limited Edition Toyota GT86 GRMN can do. What is the Toyota's GRMN? It’s a street-legal version of a race-spec Toyota 86. The track-focused sports coupe comes on the heels of the concept 86 coupe that was unveiled at the Tokyo Auto Salon in 2014. The car was created by Toyota’s motorsport division, Gazoo Racing Meister of Nurburgring (GRMN). Watch as the professional driver pushed it hard around the Nurburgring. The GRMN 86 comes modified with ten things that Subaru Technica International needs to do to the BRZ. It gets a mix of aluminum and carbon-fiber body parts like bespoke front and rear spoilers to reduce curb weight, hood air vents for better cooling, stiffer suspension, drilled brake rotors with six-piston calipers, and sticky 17-inch Bridgestone Potenza RE 71/R tires. Inside, the new 2015 GRMN 86 comes with a wrapped sport steering wheel, gear knob and hand brake as well as special racing seats with additional side support and four-point harnesses. Under the hood, the Limited-Edition GRMN 86’s still comes with Subaru’s 2.0-liter naturally aspirated boxer but gets upgraded with exhaust and ECU revisions that add around 20kW (28hp), taking the GRMN86’s power up to 170kW (228 hp). It’s not a turbo 2.0-liter power plant, but it gets enough extra hp to pump up the fun-to-drive meter. Add this to the revised suspension and it dials up driver engagement considerably. Add the wing on the back and it looks more menacing than the standard GT86/FR-S/BRZ sports coupe. After a few hot laps around the track, Kageyama was asked for a quick evaluation of the limited-edition GRMN 86. He said, “The car handles just like a Nurburgring 24-hour spec machine. It turns in well with loads of steering feel and lets the driver know early what’s happening at the rear-end, which makes correction very readable and progressive.” Subaru needs to let STI get their hands on the BRZ and produce a limited edition street-legal version of a race-spec Subaru BRZ like the Toyota GT86 GRMN. I don't know what 68% of that moto-speak even means. Stick to your roots Subaru. No one wants this 2wd BRZ.